It started out as two friends wanting to create a new project in order to adapt a more classical sound, and though it took a few years to finally get off the ground, the Electric Light Orchestra became huge for their entertaining symphonic meets art rock style in the 70’s. Led by the talented Jeff Lynne, their presence on both the concert circuit and the charts was felt for many years. They may not be present in the Rock and Roll Hall of Fame (yet), but they still won over people from around the world, including in the U.S., where a great run began for them several decades ago. 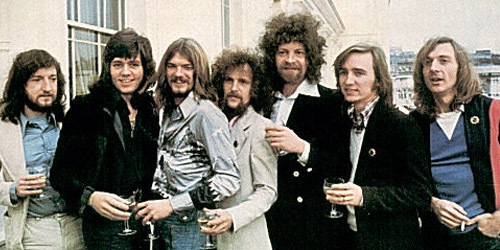 Today (April 28) in 1973, the Electric Light Orchestra‘s “Roll Over Beethoven” debuted at #90 on the Billboard Hot 100, becoming the group’s first single to chart on any major U.S. survey. It was the leadoff single from their second LP, Electric Light Orchestra II, issued on United Artists. It topped out at #42 in late July after a wild ride up to #65, then a crash down to #100, and then up the chart once more to its peak just outside the top 40. “Roll” also climbed to #48 on Cashbox and all the way to #31 on Record World, the two other big trade papers at the time. The single also helped the album to reach #62 on the Billboard 200 that year, a much better position than the #196 achieved by No Answer about a year prior. Things were very much looking up for the guys. Following their first chart record in America, it would take ELO nearly two years to score a top 40 entry, but when they hit with “Can’t Get It Out Of My Head”, it soared to #9 on the Hot 100 and really set them on their way. From 1975 until 1986, 20 of their singles went top 40, including such Classic Rock radio staples as “Evil Woman” (#10, 1976) and “Don’t Bring Me Down” (#4, 1979). The last, “Calling America”, peaked at #18. Even during the biggest days, they never sent a single to #1. (On rival Radio & Records, “Shine A Little Love” did spend a week there in 1979.) After an extended hiatus, the group recorded album Zoom in 2001, but it failed to make a significant impact. Jeff Lynne and Richard Tandy have since played together live, but the full band hasn’t played in any configuration in years. Still on the airwaves and perhaps the odd showing of Xanadu here and there (which is still one of the best soundtracks of the 80’s), there’s no need to “roll over” this Orchestra yet. Ludwig may care to differ, but he’s just one guy. Luckily, guys and girls can still enjoy this record that beats to the baroque while relishing in the rock, just another milestone in music history.